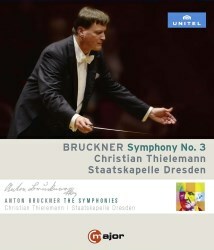 The Bruckner symphonies released to date in this series of live performances with the Staatskapelle Dresden under Christian Thielemann are the Fourth, Fifth, Sixth, Eighth, and Ninth. Previously Thielemann’s Bruckner has been represented on Blu-ray by the Fourth and Seventh symphonies with the Munich Philharmonic from 2006/08 (review), and the Seventh from his inaugural concert as music director of the Staatskapelle Dresden in 2012 (review). I’m unsure whether the latter recording is integral to the current series, but given the generally downward progression of the ‘numbers’ released so far, it appears to complete the sequence. So we now arrive at the Third. This has personal significance, as it was the first Bruckner symphony I got to know, and infected me for life with the Bruckner sound. It was Eugen Jochum’s 1966 LP account with the Bavarian RSO on DG, using the Nowak edition of 1889. This is the most truncated version of the symphony, and was largely de rigueur at the time, presumably for practical reasons among others, as at typically just under an hour in length it would fully occupy an LP, if adequate dynamics were also to be preserved. The CD’s 80 minutes or so of recording time then provided greater scope generally, and for Bruckner’s Third in particular, an opportunity to explore the longer versions that went back to its debut in 1873. I refer readers to John Quinn’s recent MWI review of the new Andris Nelsons CD of the Third, where an excellent summary and discussion of the various versions is given. In short, there are three key editions, successively shorter, from 1873, 1877 and 1889. All have been recorded now, so listeners and critics alike can acquaint themselves with each version and, if inclined, decide their preference. As it appears, though, the later the version, the more numerous are the recordings. For the current concert recording, Christian Thielemann has chosen the 1877 version, most recognisably different from the 1889 version by its extended and elaborate peroration to the Scherzo. Thielemann is accompanied in this choice by Bernard Haitink, who recorded the 1877 version twice, first with the Concertgebouw Orchestra in 1963 (on LP, an exception to the norm noted above), and then with the Vienna Philharmonic Orchestra in 1988 (review review). Comparing just the movement timings between Thielemann and the latter Haitink, they are within a whisker of each other all the way through, allowing for any gap differences between the movements. The similarities don’t end there. The Third has the reputation of being possibly the most disjointed Bruckner symphony, laden as it is with a multitude of the composer’s musical thoughts. Two things that help enormously in conveying this work are a conductor who can manage its structure to present the most unified vision, and an orchestra with so much Bruckner Klang that you forgive or forget the rough seams, anyway. Like the VPO for Haitink, the Staatskapelle Dresden are a great Bruckner orchestra, and they certainly sound it. From the opening misterioso and its inevitable march to the initial climax, release, and beyond, you are left in no doubt Thielemann’s Third will be a performance of the same breadth and majesty, underlining the work’s true stature. It’s no carbon copy, though: there is a sense of greater tempo flexibility, for example affording the woodwind interludes more expressive space, but without detracting from the overall line. The wider dynamics also register, beautifully calibrated from the softest murmurs to the most declamatory climaxes. As an aside, I’m often reminded of Bruckner’s apparent influence on the Hollywood composers: at 10:00 when the opening misterioso returns, largely in the strings, déjà vu tells me I've heard something rather similar in a 2003 blockbuster about an angry big green man. The Andante second movement, marked quasi adagio, brings respite and repose after the heaven-storming first, surging ardently skywards only near its end, but then finishing as peacefully as it began. Here the glorious Dresden strings come to the fore, Thielemann coaxing playing of great affection and warmth. If the latitude given to the woodwind now seems to stall momentum a little, such perhaps are the indulgences of live performance. The mercurial Scherzo follows, infectiously buoyant, the trio sections aptly and liltingly Viennese, and coming to an animated end with its tell-tale 1877 coda. Thielemann mostly excels in the final challenge of this symphony, holding the allegro’s disparate episodes together as a unified whole, and with the Staatskapelle Dresden convincing you it couldn’t be any other way. If the resplendent brass hadn’t bowled you over yet, they couldn’t fail to here as they launch the movement and then bring it home, the symphony’s opening theme now transformed from one of probing uncertainty to a ringing declaration of triumph. And if you were hitherto in any doubt as to the sense or the destiny of this symphony, the way is now clear. As perhaps another concert indulgence, Thielemann ends the work with a quite pronounced ritard, leaving the final chord to resound for what seems an age before the Munich audience break their respectful silence, first with a trickle of applause, then tumultuous acclaim. Production values for this Blu-ray are high: I’ve had to come to terms with the excessive use of close-ups for concert vision such as this, but the directorial style is at least not as restive as some. For most of the big moments, the camera relaxes back to take in the whole scene. Colours are deep and rich, and the picture, while crisp, could be just a tad sharper. I sampled the surround sound without vision, and in the spacious ambience of the Philharmonie Munich there is a real sense of occasion; the orchestral perspective and balance would do an audio-only production proud, and while there is some congestion in the climaxes, there is thankfully no sense of compression. Audience noise is occasionally intrusive, but possibly of more concern is the audience vision which shows, as worldwide, an increasingly aging trend. At present, as best I can tell, this is the only Blu-ray version of this symphony, but could hardly be bettered as a first entrant. While as an interpretation and performance of the 1877 version it would not supplant Haitink’s, it is in many ways on equal terms, and naturally provides the frisson and sense of occasion that only a live production can, as well as the opportunity to observe one of the world’s great Bruckner orchestras in concert. Most importantly, as Bruckner’s Third is commonly not counted as one of his ‘mature’ symphonies, Thielemann’s performance is to be warmly welcomed as another majestic and compelling case to establish this work as a true masterpiece. Finally, a brief reflection on the historical performance of Bruckner’s symphonies, as exemplified by this one. The liner notes quote from Max Auer’s biography of Bruckner, describing the scene when he conducted the premiere of the 1877 version at the Musikverein: “After the last note, the musicians hastily took flight, leaving Bruckner all alone in the middle of the great podium. Gathering his notes together, glancing mournfully into the empty hall, he left the scene of his great defeat.” While it’s easy, as here, to over-play the pathos (who was actually present to observe the mournful look? ), it’s manifestly clear that Bruckner wasn’t deterred from conjuring up even greater ‘defeats’, aka symphonies. One could imagine that had such a performance as Thielemann’s with the Staatskapelle Dresden resounded through the Musikverein on that occasion, the desolation described by Auer would hardly be conceivable, even with the most bovine of audiences. But more importantly, 140 years on, that had Bruckner’s spirit been present at the Philharmonie Munich for the current performance, he would emphatically have been assured he’d won an eternal victory.